Apprentice jockey Syafiq Iskandar Rosman finally notched his first career win when he piloted TESORO PRIVADO to victory in the $80,000 Kranji Stakes C event over 1600m at Kranji here tonight. The Malaysian lad had ridden 36 times since licensed his year and found one to beat five times. But his only ride of the evening mattered this time. The Argentinian gelding had won his last start easily but after hitting the front making the turn into the straight, he had to fight off several challengers to win by half a length. It was the fifth win in 13 starts for the son of Orpen but two-for-two since joining the yards of trainer Lee Freedman. Iskandar himself joined Freedman after starting out for Jerome Tan in Penang, then moved across the Causeway, originally to Steven Burridge, followed by Laurie Laxon and Freedman. "The boss told me to use the horse’s speed to lead, but if someone else is faster, to take a sit. 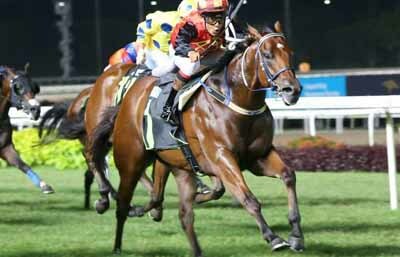 I was very happy where I was in second position," said Iskandar of his winning ride. "I went for it when we turned for home, and even though we hit the front a bit too early, I just kept riding him out." "I’ve always seen good qualities in this kid, and I’ve noticed he’s been riding good races since he came back from injury," said Freedman. "That’s why I threw him in at the deep end as he’s done nothing wrong so far."